Rule 46 (b) of the CGST Rules 2017 suggests that any tax invoice should have a 16 character alpha-numeric invoice number unique for a financial year. This draws attention, now that we are entering a new Financial Year – 2019-2020. “Attention of all taxpayers is invited to Rule 46 (b) of the CGST Rules 2017, which specifies that the tax invoice issued by a registered person should have a consecutive serial number, not exceeding sixteen characters, in one or multiple series, containing alphabets or numerals or special characters - hyphen or dash and slash symbolized as “-” and “/” respectively, and any combination thereof, unique for a financial year. If the provisions of Rule 46 or Rule 49 are not adhered to, apart from being a compliance issue, taxpayers may face problem while generating E-Way Bill on E-way bill system or furnishing their Form GSTR 1 or for applying for refund on GST Portal. It is therefore necessary that suitable modification may be made by the taxpayers in this regard in their invoices or bill of supply, to avoid any inconvenience in the future. This is important considering the fact that the entire GST system is based on the invoice number. The invoice number is the unique code for every transaction happening in the business. Also, the uniqueness has to be there to identify transactions for a particular Financial Year as well. 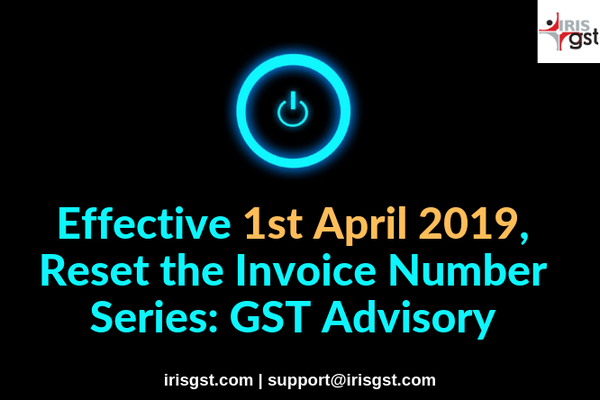 Hence, it is advisable to reset your invoice numbers to 19-20 from 18-19. This will help to have invoice numbers unique to the financial year. Can we start Invoice no. from 10001 or 20001 or it has to be started from 1.
necessary to start with 1. Invoice number can also comprise of alphabets hence it can also start with A001 etc. However, it is advisable to have Financial Year details in the invoice number like 201819/ 1819 etc for easy identification at a later stage.